Welcome to Author Wednesday. 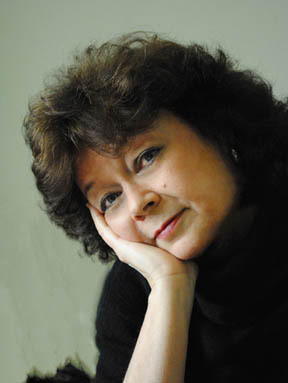 Today I welcome Sarah Mallery, author of historical fiction and contemporary literature. I’m currently reading her novel Unexpected Gifts, which asks the question, Can we learn from our ancestors? Not only does the book explore the history of twentieth century United States, it also considers the present day as the main character searches for answers. She’s getting ready to publish a book of short stories, Sewing Can Be Dangerous and Other Small Threads. Each of the stories are filled with suspense, mystery, action, and historical elements. Welcome, Sarah. I’m so happy you could join us today. It’s been a pleasure to meet you and read your work. I’m always curious about “voice” and how a writer knows when they have it. When did you first discover your voice as a writer? Do you have any special writing rituals? I’ve been known to write entire scenes at a Carl’s Junior, but in general, I do write at home, either on the computer or at my desk, scribbling away next to a chirpy-purring cat named June. Her brother Rocco is usually nestled at my feet. But then, as I’m doing now, I can sit waiting in a car, a restaurant, a school and write away, to be typed up and edited later. You sound a bit like me. When the muse hits, I can do it anywhere on anything. What is your vision of yourself as a writer? I see myself as an author who keeps learning, growing, experimenting; exploring new time periods, working on style, descriptions, and all the rest. I think the best writers do that. I don’t ever want to stop learning or remain stagnant in what I write. Who has most influenced your writing? I have loved various writers, but the ones that really got to me were authors such as Harper Lee, Betty Smith, Mark Twain, O.Henry, Flannery O’Connor, Margaret Mitchell, and William Styron. I loved their great story telling, their clarity of prose, and great descriptions without being too overly verbose. Excellent ones to emulate. What are you working on these days? I am finishing up the last edits of my collection of stories, Sewing Can Be Dangerous And Other Small Threads, due out very soon. I am also trying to keep my hand in writing by working on more stories, flash and longer for another collection. I have also been doing some research for a Civil War novel, for the future. What knowledge have you acquired recently that might assist other writers? First of all, I’ve learned so much from my publisher—the back and forth editing process, the collaboration on the book cover and trailer, the learning process of Twitter, Facebook, and Goodreads. But I have also learned that the process of writing and research is very, very different from marketing. I can get into the latter, but when the balance is off, and I’m not really doing much writing or researching, I feel somewhat disjointed, out of whack. So, although I am still discovering different ways of promotion, I really try to keep my mantra going: balance-balance-balance…..
You explained my dilemma exactly these days. Let me know when you figure out the best way to keep balance in our lives. Why have you chosen to write historical fiction? I have always appreciated looking at photographs from both my grandmothers’ photo albums. As I studied my individual relatives, I wouldn’t just think, “Oh, that’s my Aunt So-and-So!” I would scrutinize their outfits, their faces, their postures. Were they sad? Happy? Bored? Annoyed at suddenly being put on display? That strong ancestral interested dovetailed nicely with my love of U. S. history, so when I decided to write this novel, putting those two themes together just kind of clicked. How does setting play a role in your books? It means everything, frankly. 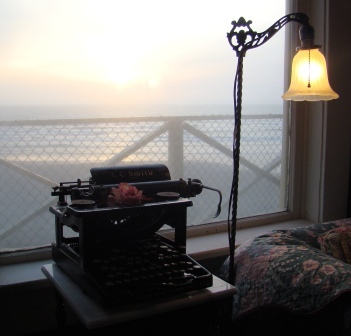 Writing historical fiction, if you don’t have decent settings, then what’s the point in trying to introduce readers to other places, other times? Very true. Are you planning to continue writing in the same genre? Yes, even if I end up writing murder mysteries. As long as it takes to do research, I realize that’s what turns me on—reading about different eras and then putting them into living, breathing stories. How did you choose the title Unexpected Gifts and was it the title from the very beginning? The ‘Gifts’ part was suggested by a friend, the ‘Unexpected,’ by me. It kind of sums up the essence of the book, I feel. How long do you estimate it took you to take the book from an idea to a finished, published work? I would say it took a good three to four years…..yikes! That’s fairly typical. Is the book traditionally or self-published? It is traditionally published, through Mockingbird Lane Press. What is the message conveyed in Unexpected Gifts? To never take our ancestors for granted––they are as much a part of us as our current, immediate families around us. What is the best thing someone could say about this book? That it’s a book that you can really sink your teeth into. Readable, of course, but something that you walk away from, still thinking about scenes, characters, and lessons days, weeks, even months later. What type of research did you do in the writing of this book? All kinds, actually!! I studied books/articles/documentaries about each time frame, looked at many photos, read about the language from not only those different places, but also separate periods. For example, I looked up how people in Ireland talked during the early 1900’s, how African Americans talked up in Harlem during the ’20s; how in Bulgaria, they would shake their heads when they meant yes, and visa versa when they meant no; what the foods were like for each period and country, the clothes, the politics, you name it! It took quite a while, but the journey was wonderful and I learned so much. What else do you want readers to know about Unexpected Gifts? Although there is a lot of American history of the twentieth century, it is basically about a modern woman and her indecision, her problems, and her beginning to come to terms with her inner self by studying those people from the past. Do you listen to music while you’re writing? Not while I’m writing, but a lot of other times. I use it as total inspiration––when I’m driving in my car, listening to Pandora. In Unexpected Gifts, I went from a tape during the late ’90s for my main character; ’60s tape, ’50s tape, ’30s tape, an Irish music tape (for one of my characters) and even an early nineteenthcentury music tape. They all helped me think of plots, motivations, scenes, etc. How does your immediate family feel about your writing life? They are completely supportive, and if my housekeeping is not tip-top (it’s never been! ), my husband doesn’t say a word. He’s a keeper! What do you do during your down time? Thanks so much for stopping by today Sarah. I hope you’ll come back when your collection of short stories are published. About Sarah Mallery from Sarah: I have worn various hats in my life. I started out as a classical/pop singer/composer, then moved on to the professional world of production art and calligraphy. Next came a long career as an award winning quilt artist/teacher and an ESL/Reading instructor. My short stories have been published in descant 2008, Snowy Egret, Transcendent Visions, The Storyteller, and Down In the Dirt. “Unexpected Gifts,” my debut novel, is currently available on Amazon. 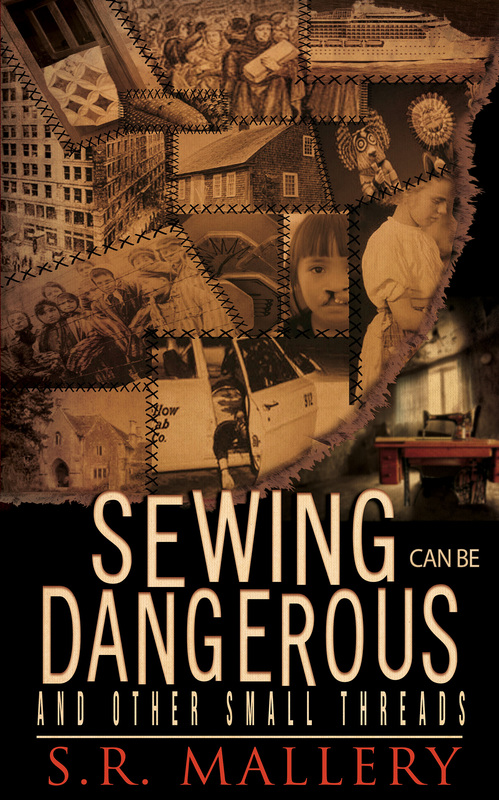 “Sewing Can Be Dangerous and Other Small Threads,” my collection of short stories is due very soon. This entry was posted in Author Wednesday, Ramblings of a Writer and tagged amazon.com, authors, characters, fiction, historical fiction, novel, short stories, writers. Bookmark the permalink. I do, too. Review will follow on Friday.